Marianne Design's October Release is full of wonderful winter themed dies, stamps, and design folders sure to help you make some pretty awesome cards for the chilly season that is right around the corner. Call 574-784-9050 or e-mail: myjoansgardens@yahoo.com to order. own village/city/town with these cute dies. them up to make a forest or add some snow effect for winter! or layout or just use as a frame! 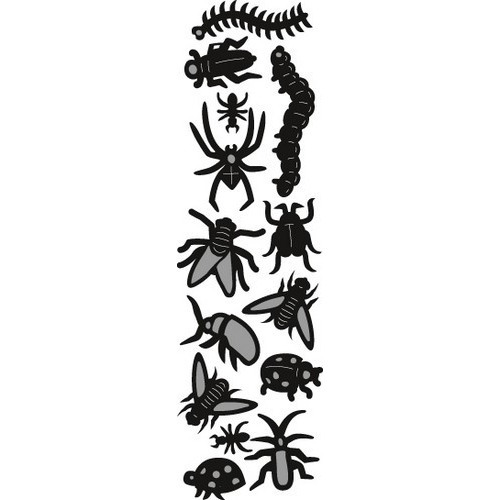 Smallest die: 1.75" x 1.75"
Largest die: 5.25" x 5.25"
This 1 piece die cuts out a variety of spiders, bugs, worms, etc. Perfect for your Halloween cards/layouts and decorating! This 1 piece die cuts out a variety of Christmas decorations..
make a shaker card with these baubles! layer and shape to customize your own tree. Cut out of patterned paper for a unique look! Largest die: 3.0" x 2.10"
Build-your-own snow people with this cute die set. Smallest die: 0.50" x 1.10"
Largest die: 1.60" x 1.55"
and snowman in this month's release. Smallest die: 0.50" x 0.20"
A beautiful background on your cards or layouts with sparkling stars. Add gilding wax or polish to highlight the stars! Just add gilding wax or polish to highlight the details! background too! It includes a row or pine trees and a shining star..
.Perfect for those Christmas and winter cards/layouts. Pine tree Border: 5.40" x 1.35"
a "cool" border to your cards/layouts. Add embossing powder or glitter for texture! The words "It's the most wonderful time of the year"
in the shape of a Christmas tree! Just stamp and you have an instant card! Smallest Stamp: 0.40" x 0.40"
Largest Stamp: 1.60" x 1.90"